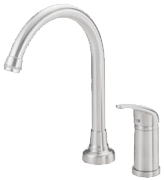 Your Kitchen Faucet and Price – Why the Differences? I know we’re a nation of bargain hunters and rightly so. After all, why would you pay more for something when you can get it cheaper elsewhere? However, when you’re dealing with a fixture like a kitchen faucet you do have to be a bit careful about putting price over quality. As you will see from this information page I’ve added to my website, a lot of problems can happen if you don’t make sure the faucet you choose is of good enough quality. Of course, there are a number of things that will determine how much you pay for your kitchen faucet and I’ve taken the liberty of giving you a few to think about below. This is one of the most common reasons you’ll find the price is higher on a kitchen faucet. If you’re looking for something that’s “all singing, all dancing” you will pay more. For instance, I have reviewed touchless models for you. These will definitely cost you more than a faucet that doesn’t use this type of technology. So when you’re looking for a faucet in your kitchen my advice would be to think about whether or not you need to be able to switch it on without touching it. In fact, it’s not a bad idea to write down what you really need from your kitchen faucet. Design has come a long way with faucets, especially those in the kitchen. Nowadays this fixture isn’t something that just sits in the background and performs a function. I have had many customers who want their faucet to make a statement about their own sense of style, and manufacturers have responded to this demand very well. So again, when you’re on the hunt for a faucet do bear in mind that if you want an “out of the ordinary” color, or a few more curves than other models offer, this might cost you a bit more. I have reviewed a number of different types of kitchen faucet for you, and these range from single handle pull down to the traditional two handle type. If you haven’t yet had a look around what models I have decided to include I’ll let you in on a little secret. The cheapest faucets out there are the two handle type and this is mainly because there is little in the way of complicated technology. It’s entirely up to you what type of faucet you decide to buy. Just think about what exactly you need instead of being dazzled by various features that may not be used that often (if at all), and keep in mind that designs that amaze you when they’re on screen might not fit with the overall look you have in your kitchen.